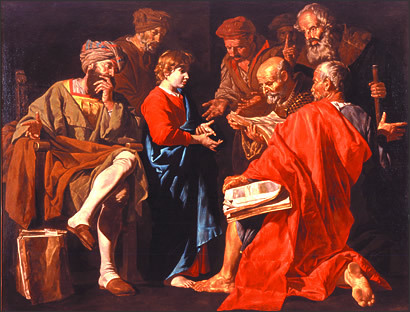 Jesus as a 12-year old boy confounds the religious experts by the questions he asked and the answers he gave them. How could a 12-year old astonish the best theologians of his day? Why was the knowledge of Jesus radically different than everyone else? The fall not only made our physical bodies frail and prone to disease, sin also confused and darkened our minds. Theologians calls this problem the “noetic effect of sin” (from the Greek word for ‘mind’). Sin impairs our ability to think clearly. Of course, we still have the capacity for reason and rational understanding. We can still pursue philosophy, science and wisdom with some success, but in our fallen state we make mistakes in our thinking both small and serious. The old adage “To err is human” is a constant reminder of our fallen state. But Jesus’s mind was not clouded by the noetic effect of sin. His thinking was clear. His logic impeccable. His mind, thoughts, presuppositions and understanding were perfectly attuned to God. Jesus at 12 wasn’t showing off. He simply was not hampered by the effects of sin, and the result astounded the religious experts of his day. The noetic effect of sin helps explains why two sincere bible-believing Christians can study the same passage of scripture using the same methodology and reach different conclusions. We are errant. While we have the same basic material to work with, and some may study more diligently or have more background and education, all of us remain affected by sin. All of us make logical errors, jump to unwarranted conclusions and cling to wrong presuppositions. To improve our Bible study, we must approach the text with humility, starting from the premise that my human understanding is flawed and willing to lay aside any presuppositions challenged by the text.